Multiple Sclerosis (MS) is a disease in which the body's own immune system attacks the protective sheath (myelin) that covers nerve fibers, causing communication problems between the brain and the rest of the body. MS is known as a very unpredictable disease because it causes nerve damage — and nerves reach every part of the body. Symptoms can therefore occur anywhere, depending on which nerves are damaged and how severe the damage is. The central nervous system (CNS) consists of two types of tissue: grey matter and white matter. Put simply, white matter allows communication between areas of grey matter, which is where 'processing' takes place. In computer terms, areas of grey matter are 'CPUs' and white matter is the 'wires' that connect them. 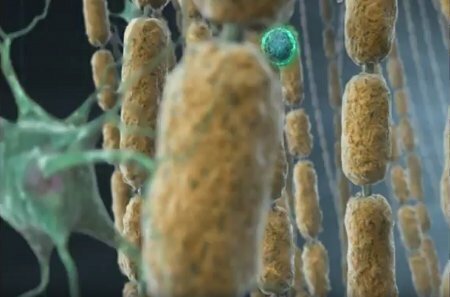 Myelin is the fatty protective sheath that surrounds axons (nerve fibers) to provide electrical insulation and speed up nerve impulses, just as wires in a computer are protected by an insulating plastic sheath. Myelin is white and gives "white matter" its name. Multiple Sclerosis is a demyelinating (myelin-removing) disease of the white matter of the central nervous system. Axons form the communication system both within the CNS and between the CNS and the rest of the body. Multiple Sclerosis is the most common demyelinating disease of the central nervous system, affecting over 2 million people worldwide. In the United States alone, there are at least 250,000 cases. For reasons that remain unclear, it is more common in northern temperate zones and is 20 times more prevalent in those of Northern European descent. MS affects about twice as many women as men; it usually affects those aged between 15 and 50, the average age of onset being 30 years. The lesions ('plaques') of Multiple Sclerosis are areas of tissue damage arising from inflammation, which occurs when white blood cells and fluid accumulate around blood vessels. The blood-brain barrier is a layer of tightly-packed cells on the walls of blood vessels which only allows certain substances – such as sugars – to enter the brain from the blood. After an infection, the blood-brain barrier may become damaged, allowing immune cells that are circulating in the blood to enter the brain. 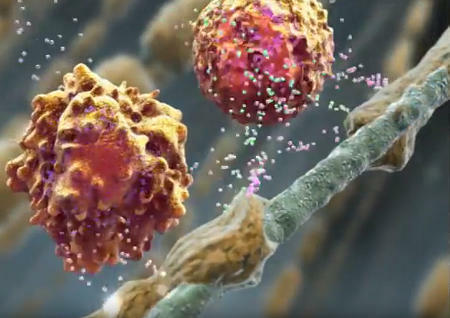 These immune cells incorrectly recognize myelin as a 'dangerous substance' and produce inflammatory substances that damage it; this is why MS is considered to be an autoimmune disease. After the demyelinization (destruction of myelin) has taken place and the fragments have been cleared away, multiple scars (or 'sclera') are left behind in the brain and spinal cord at these locations. This damage impedes conduction of nerve signals by blocking or slowing communication, either completely or partially and from time to time. The process can be thought of as being similar to an electrical short circuit. The symptoms of Multiple Sclerosis result from this loss in signal conduction. The reason why immune cells attack myelin is unknown, which in turn means we don't know the cause of MS itself. Studies indicate that an environmental factor, perhaps exposure to a virus, when combined with a genetic predisposition to the disease, may well dictate occurrence of MS. Although MS is not a genetically-transmitted disease, having parent(s) with the disease does slightly increase one's risk of developing it. Exposure to certain viruses, such as human herpesvirus 6 (HHV-6) or the Epstein-Barr virus, may trigger MS although no definite connection has been made. Toxins in tobacco smoke have been linked to a higher risk of developing MS. The most important fact about MS is its unpredictability and its uncertainty. There are very few certainties to be found anywhere in any aspect of this disease. Symptoms may appear very rapidly, within minutes or days, or very slowly, over a period of weeks. They may be very transient and come and go rapidly. New symptoms may accumulate; old symptoms may reappear and/or intensify. A progressive course involving a slow and continuing progression of the disease with no remission (30% of cases). A neurological examination can indicate lesions through the presence or absence of various signs and reflexes. Computerized tomographic (CT) scans will show some lesions. Magnetic resonance imaging (MRI) usually reveals many more lesions than the CT scan, including some that may be subclinical. An autopsy will usually show many more lesions than were suggested by either symptoms or signs. These lesions are probably the result of subclinical attacks of the disease. Brain wave testing of responses to various forms of stimulation of the eyes, ears or other parts of the body may demonstrate delays in these responses and indicate lesions that are clinically silent (producing no symptoms) and can sometimes firm up a questionable diagnosis from probable to definite MS. Testing of the cerebrospinal fluid for protein content, the number and type of white blood cells, and the amount of Ig6, a gamma globulin, can also support a diagnosis. An old diagnostic technique is to see whether a person becomes worse after a hot bath. There is no cure for Multiple Sclerosis. Many promising modes of treatment are being developed and tested but most remain experimental. 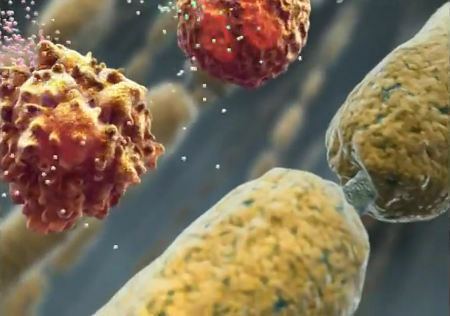 Current conventional treatment focuses on regulating or suppressing the immune system with a variety of different drugs. Unfortunately, prolonged usage of these drugs decreases their effectiveness and increases side-effects. The results of Dr. Swank's 34-year study from 1949-1984 are impressive. Patients diagnosed as minimally disabled showed very little progression of the disease. Only 5% of the diet group failed to survive the 34 years of the study while a remarkable 80% of those not following the diet failed to survive the same time period. Moderately and severely disabled patients progressed much better subjectively and objectively than those that did not follow the diet. The diet has been credited with preventing a worsening of the disease, greatly reducing fatigue, and dramatically reducing the death rate. Some of those with an exacerbating-remitting course will eventually develop a slow progression involving fewer and less complete remissions with cumulative disabilities. Very rarely, there is a rapidly progressive course leading to death. MS itself is almost never the cause of death; death results from accompanying complications or infections. Generally speaking, the life expectancy of those with MS is at least 75% of normal, often only reducing lifespan by a few months. However, quality of life is decreased significantly due to the various debilitating symptoms. Exacerbations (episodes of new disease activity) are not easy to diagnose with certainty. New symptoms may result from old areas of disease that were previously silent. Conversely, recurrence of old symptoms is not a sure indication of lack of exacerbation. Over time, the disease process may result in the formation of new plaques or the enlargement of existing ones. Exacerbations can be caused by heat, physical trauma, extreme fatigue, psychological stress, infections, or any other kind of stress. While all of these factors have been associated with exacerbations, there is little empirical data to support these associations. An enormous amount of research is currently being done on the causes and processes of Multiple Sclerosis, and understanding of the disease continues to increase. Difficulty speaking may result from a variety of neurological disturbances, including Multiple Sclerosis. Weakness, stiffness, or uncoordinated movement of the muscles controlling the lips, tongue, jaw, soft palate, vocal cords and diaphragm can all cause speech problems. Multiple sclerosis that affects auditory nerve pathways in the brain can cause sensorineural hearing loss. Vertigo is a fairly common symptom of multiple sclerosis, occurring in about 20% of sufferers at some point. It is an acute, uncomfortable sensation, making those who are already a little unsteady feel even more nervous about moving around. It is not a permanent symptom, but may indicate a new lesion or inflammation. This vertigo can be caused by lesions in the cerebellum, or it can be a result of damage to the nerves that control the vestibular functions of the ear in the brain stem. Vertigo is, however, not always a direct result of the MS disease process. Lyme Disease has been called "The New Great Imitator", a replacement for that old "great imitator" neurosyphilis. The two diseases share so many symptoms that Lyme disease should be ruled out if multiple sclerosis diagnosis is in question. A vegan/vegetarian diet satisfies several of the requirements set out in the Swank Diet for Multiple Sclerosis. This is part of the Swank Diet for Multiple Sclerosis sufferers. 4 had no change due to poor absorption of the histamine, poor patch adhesion, or an interfering drug. The nurse responsible for the revival of the use of histamine, Elaine DeLack, MS, RN, has collected verbal reports from over 200 individuals diagnosed with multiple sclerosis who have used histamine: 72% report at least one significant improvement in symptoms, and some many more. Dr. Nieper believes that MS is initiated by a viral attack on the nervous system, followed by an error in programming the immune system to defend it. The immune system ends up attacking the nerves, especially the myelin sheath. Normally, certain steroids eliminate this bad programming but certain pollutants such as Chlorine, Fluoride, some heavy metals and especially Aluminum, interfere with the process. The Swank diet includes a blend of 40-50gm per day of essential fatty acids as well as at least 1 teaspoon of cod liver oil per day.